Again, the goal here is not to systematize, even sterilize the relationship with God by giving prayer a "scientific" analysis. We Americans are guilty of analyzing Biblical principle through scientific mind at times - which is probably the problem! But the general cycle of Biblically based and Spirit-driven prayer is fundamentally three stages with stages one decreasing over an extended period of time as the second and central phase increase in both length and strength. You can view the cycle in your own individual life or larger bodies of Christians in congregations or even nations. This has nearly been lost in the American Church community. This is the place where get real, admit to ourselves, God and even others that we can't see straight and that we really don't know God very well. We may have truths of God in the brain, but here there is no flow. So we make a quality decision. A quality decision is a decision of no return and real resolve. "I must find God" and I'm going to take the time to look because my time is my life. Hebrews says that God is of such character that He would not promise us if we seek that we would be let down. Hebrews 11:6 says "...He exists and that He is a rewarder of those who seek Him." God is more fulfilling and real than a million dollars, but most do not know this is true. That is changing as we speak. People are seeking. We may have truths of God in the brain, but here there is no flow. So we make a quality decision. A quality decision is a decision of no return and real resolve. "I must find God" and I'm going to take the time to look because my time is my life. Hebrews says that God is of such character that He would not promise us if we seek that we would be let down. Hebrews 11:6 says "...He exists and that He is a rewarder of those who seek Him." God is more fulfilling and real than a million dollars, but most do not know this is true. That is changing as we speak. People are seeking. Part of the Park Circle Prayer Campaign, yet to be introduced, whenever the Lord leads, is an emphasis on laypeople finding God at home and changing the spiritual climate there where they spend the majority of their time. The ministry of Hollywood will have to take a back seat to the presence of the Holy Spirit before revival can ever be known. But the first phase of the cycle is looking. God is a God of Law and Order. It is no coincidence that in the Hebrew Tabernacle/Temple that the specific petitions were offered to God after the encounter occured and after the worship was offered. This is our Biblical model for the New Testament reality we experience with an invisible, yet literal, Throneroom. Most American congregations enter God's gates with a long list of prayer requests. In the past, we used to first "pray through" to His presence and then pray out of the inspiration that came with being in His presence. And so it is God's will today that we first come into view of His heart, fall down in worship and then pray out of this view. Here our prayers are not selfish, but purified and filled with power. God, by virtue of the fact that He is wonderful love in His essence, inspires within us, the desire for others to know Him and then as His legal ambassadors in a fallen territory, we speak freedom over the lives of others, including the lost. Here in this place, there is no doubt of God's will and there's no doubt of the results because we pray in His presence in Jesus' Name. This is the Ontological Argument: That Love Himself truly exists and would not bring people into such a state of believing in His Love only to find out it was not true. God is not that cruel. (Hebrews 11:6) And the people being prayed for out of this experience truly come to Christ. All the selfish begging in the world for somebody to be saved will not move Heaven, but the soul who get's a glimpse of God's heart in worship then becomes a potential conduit for God to invade the world. Our begging needs to be focused on the opening of our eyes, not for God to be God for God will always be God. Love was, is and will always be. The cycle of prayer is about getting us in line with reality, not the other way around. He has paved the way in Blood. 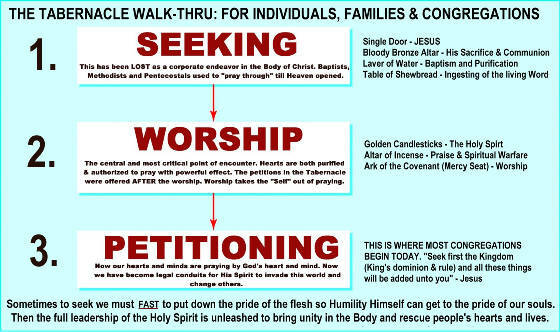 We must walk the path seeking, then encounter and worship and finally be conduits of God through petitoning prayer. On a smaller scale this happens everyday. Consider that you might take a praise and worship CD and plug it into the car player. You're seeking God. Then you began to weep and sing to Him on the way to work. You're encountering God. And finally, somebody you know comes to mind and you can feel God's love overflowing for them. You begin to pray for them according to what you know of God in that moment. Now you're releasing His Spirit into this world on their behalf to invade their lives. Now imagine large numbers of Christians coming together for extended periods to seek God. See where we can go and what kind of God invasion is possible? God tells us that He can dream even bigger; Exceedingly above anything we can ask or think.